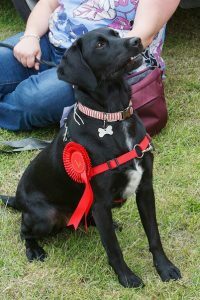 Each year at Sherfield Fête we hold a fun companion dog show. This takes place in its own small arena between 1:30pm and 3:30pm, and is judged by an independent expert. Closer to the date of the fête you will be able enter your dog(s) online, or print off an entry form to complete and bring with you to the fête. There is an entry fee of £1 per class, which is payable – in cash only please – on the day from 12:30pm. Note that owners are responsible for the behaviour of their pets at all times and for clearing up after them. Bags & bins will be provided.